For ten months, the northern German band MOB RULES ensconced themselves in their studio. Now they are set to present the results of their hard work: Tales From Beyond, the eighth studio recording by the group, impresses with a deeply melodic mix of progressive and power metal. When it comes to their lyrics, MOB RULES continue to go their own unmistakable path, influenced by historic events and inspired by literature. The album will be available from March 18, 2016 on Steamhammer/SPV as Digipak (incl. 1 bonus track + poster), double colored vinyl LP and digital download. In addition, there will be an extra iTunes version including an additional exclusive bonus track called "Ghost Town", which has also been newly recorded. Their powerful songs and haunting chorus parts have earned MOB RULES an excellent reputation over the past two decades both in their native country and abroad. Their anniversary boxed set Timekeeper, which arrived at the stores in October 2014, has been incontestable proof of the complexity and uniqueness of their material. Tales From Beyond sees an evolvement of the band's earthy and multi-faceted sound while the Celtic/British influences of their music have been honed even more finely. The current album is marked by a "new directness" which not only goes down well with MOB RULES's own fans but will also win the group many a new metal fan. This applies all the more as MOB RULES entrusted the production of Tales From Beyond again to the tried and tested hands of sound engineer Markus Teske (VANDEN PLAS, FIREWIND, among others). 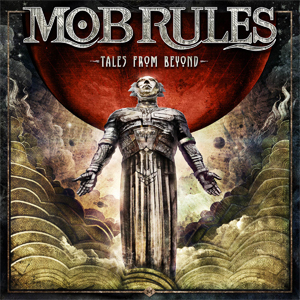 April 2016 will see MOB RULES join AXEL RUDI PELL as special guests on his extensive tour, presenting the songs from Tales From Beyond live for the first time. "A Tale From Beyond (Part 1: Through The Eye Of The Storm)"
"A Tale From Beyond (Part 2: A Mirror Inside)"
"A Tale From Beyond (Part 3: Science Save Me!)" Bonus track DigiPak: "Outer Space"